After moving to Hawaii, Emma dismisses the strange goings-on as figments of her imagination — until she stumbles upon a gathering of ancient spirits. Can she combat a curse that threatens her soul and an impossible love triangle? 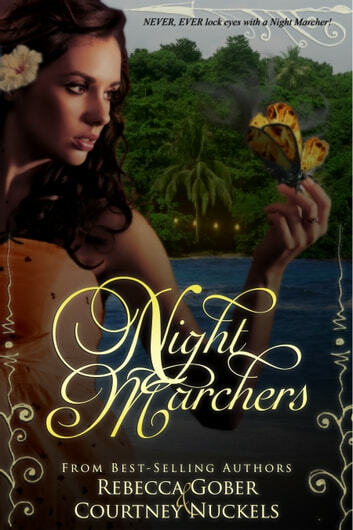 With over 600 five-star ratings on Goodreads, The Night Marchers series is a complete young adult paranormal romance series that will appeal to fans of Twilight by Stephenie Meyer, A Shade of Vampire by Bella Forrest, The Mortal Instruments by Cassandra Clare, and The Vampire Diaries by L. J. Smith. NEVER, EVER lock eyes with a Night Marcher! Everyone in Hawaii has heard this warning, except for seventeen-year-old Emma Townsend that is. For most Hawaiians know that looking into the eyes of Night Marcher can strike a curse that will end in death or eternal servitude. Even though her paranormal investigator father solely raised Emma, she has little experience in the realm of the supernatural. After being forced to move with her father to Hawaii only months before her graduation, Emma starts seeing the unexplainable — fire balls in the distance, beating drums in the middle of nowhere, and strangers who vanish into thin air. When an eventful evening lands Emma in the middle of the woods at night, she comes face to face with a procession of Night Marchers. With the help of a mysterious stranger, Emma barely escapes and finds herself on the run for her life. With her life at stake, and a curse chasing her, Emma must put her trust in a man she knows little about to survive. "The story is original, thrilling, includes several twists in the romance department, and in the supernatural content as well." "I am always interested in things based in some kind of paranormal "truth" and this story didn't fail to impress with the authors obviously having taken a great deal of time to do their research. By the time I got to the end I could not wait to pick up the second one and see where the story went." Such an awesome book! There is never a dull moment!